A termite infestation is far more common in the Northeast than one might expect, even in Pike County, Pennsylvania. Whether your home is in the heart of Milford, or in the woods of Dingmans Ferry, you can be at risk for termites. 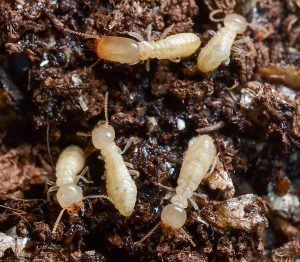 What Role Does a Termite Play? Termites are decomposers, you can think of them as the ecosystem’s janitor. They help break down and reduce fallen trees into fertile soil, and they do a pretty good job. The problem is that they don’t know the difference between the wood in fallen trees and the wood in your home. When that happens they can do some serious structural damage, and this can happen for years without you noticing! How Do We Take Care of Termites? Installation of stations in the ground 10 to 20 feet apart by one of our experienced termite technicians. The stations are inspected at periodic intervals for the presence of activity. When we find termite activity the bait is added. Repeat inspections between 30 and 45 days until activity ceases. Termites are colony insects; the worker termites gather food to feed to the colony. The Exterra Termite Monitoring & Baiting Program uses this knowledge to effectively exterminate the colony. When activity is observed our service technician adds the bait to the station. The bait slowly eliminates the colony, as the worker termites will bring it to the colony for them to eat. If we expose them too quickly they’ll avoid the station, but if we do it too slowly it’ll take too long. Our experienced technicians know just the right dose to get rid of their colony, once and for all, and continued monitoring help protect your home from future termite intrusions from new termite colonies. Fixed walls, floors, ceilings, cabinets, shelving, stored items, ductwork, plumbing, wiring, furnishing, appliances, and insulation limit the ability to inspect for termites. Even under the best of conditions for a home, typically 85% to 90% of the structure is inaccessible to inspection. Even though not all finished basements get termites, there isn’t really anywhere to detect them. Because of this limited detection, termite damage can go undetected for years. Termites can access your home through small cracks (1/64 of an inch) in concrete, cement block, or stone. Keep the moisture away from your foundation. Make sure you have properly working downspouts. Avoid having your siding contact the grade (ground). There should be a gap of at least 8 inches between the ground and where your siding begins. An improperly sloped porch can have moisture running towards your structure during rainstorms, I’d recommend covering your porch with a roof. Don’t plant plants and vegetation next to the foundation, and clear out plants and dense vegetation near it. Plants draw in plenty of moisture, which can damage your foundation and attract termites. Wood debris can attract termites. Having such debris on the ground near your house or under your porch is problematic. If you are interested in learning more about termites then check out our homeowners’ survey.